New surgical techniques have at last brought hope to many patients with disfiguring injuries of the arms and legs. Using microsurgical techniques and custom free tissue transfer, most defects and deformities of the limbs can now be successfully reconstructed. The psychological benefit of this kind of surgery should not be underestimated. A 51 year old lady had surgery to remove a malignant tumor from her right buttock. The deformity was reconstructed by David Floyd using microsurgical transfer of abdominal tissue to restore the volume and contour of the buttock. A 27 year old lady was involved in a car accident. She broke both legs in 2 places and after life saving surgery she was left with contour defects. Mr Floyd used abdominal skin to reconstruct the right knee and a calf implant for the left knee. A 39 year old man, had a severe laceration to his wrist. 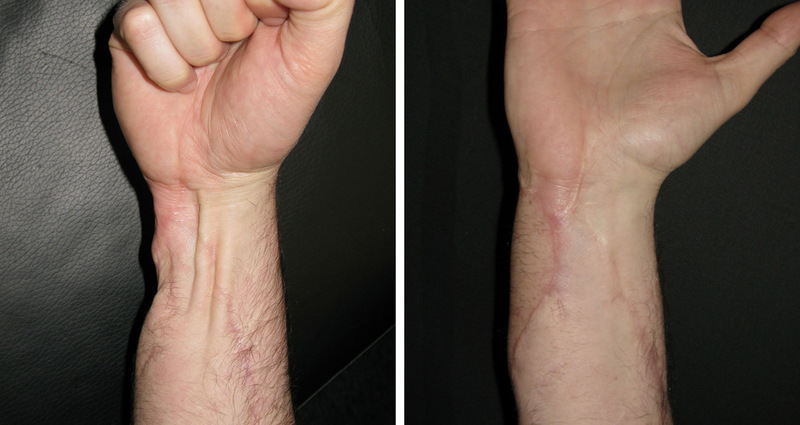 He needed a skin graft to cover the ulnar nerve and the bone of the wrist. As it was so sensitive David Floyd reconstructed the defect using a free flap of skin and fat from the opposite arm.